Mother's don't need to be perfect, all the time! It happened. That magical moment a lot of expectant couples have been waiting for (or not in some cases). Two bright pink lines stare back at you. Yes, you are pregnant. After the initial jubilation, at discovering you are now pregnant and incubating this tiny human being within you, can come a whole flood of different emotions – fear (what have I done? can I go back in time? ), confusion (I wanted this, but I’m not feeling maternal), and uncertainty (my life, my job is over). It’s perfectly normal to feel this way. The seed is sown, the deed is done. So, we take a few days to get over all these overwhelming emotions, and try to rationalise our feelings in whatever way makes sense to our muddled, emotionally overloaded brain. My hack – I can have many more cheat days now that I’m pregnant (lol) and try to stay positive about the next few weeks, months, years of our life. Slowly, we accept and even start to welcome the change, excitement and joy that awaits us on this new journey. Little be known to us that there is this little monster called pregnancy sickness that’s going to creep up upon us and put a complete damper to all the happy thoughts and healthy eating and exercise plans we were dreaming up. It can start as early as 5 weeks and go on up to week 12 to 16; and in the unlucky few even last the entire pregnancy (more strength to those moms). More than 50% of moms experience nausea and vomiting in the first trimester with symptoms ranging from mild to severe. Moms, if you are one of those few who are experiencing pregnancy sickness and don’t know what just hit you don’t worry. Take solace in the fact that there are others like you out there whom can sympathise. And others who cannot simply because they’ve never experienced what you have.There will be loads of advice from well wishers about when you should eat, what you should eat, how exercising or walking is a must do and will make you feel better, how it’s all in your head and how you need to control your hormones (husband’s inputs mainly). I’m sure we all had plans of eating perfectly, drinking the right amount of water, getting the right amount of sleep and exercising well. Once the pregnancy sickness hits, our benchmark is lowered to eating one meal without throwing up, drinking water without throwing up, sleeping till this nightmare ends and exercise, well what’s that (does taking a bath count)?! Well mom’s here’s my advice to you. 1. Eat small amounts of whatever you can keep down. For some that may be crackers or ginger tea or healthy options like fruits; whilst for others it may be unhealthy variants of packaged foods. This is not the time to fuss. If you can keep it down, go for it! Sometimes even drinking adequate fluids will be a task. As long as you are not severely dehydrated, the body will cope. 2. As a physiotherapist, I’m a huge advocate of exercise. However, this is one time I say if you don’t feel like it, don’t force it (disclaimer: not to be used as an excuse if you are feeling well). Your body and hormones are going through lots of changes at this point which can leave you feeling fatigued. The pregnancy sickness can make you feel miserable, tired and not wanting to do much. That’s perfectly alright too. There will be times through this period when you have a good day and can manage a walk or some light stretching just to find that you are back to square one the next day. Golden rule: listen to the body. 3. Sleep, aah sleep. You may want to take a nap in the middle of the day or retire to bed at 8 p.m. Do it. Your body’s working overtime. If it demands the rest give it what it wants. There will be plenty of sleepless nights I guarantee you. Similarly, there will be days when going to work or getting out of bed is simply not possible. Let yourself be a slacker. There’s plenty of time to make up. 4. If you are feeling listless and lethargic and having mood swings don’t let that bother you. The hormones, along with the sickness, is enough to make anyone grumpy and miserable. Explain to the family how you feel. If they love you they have to deal with this person as well. So folks, yes not everyone has the ideal first trimester. Some symptoms such as pregnancy sickness and exhaustion can be downright debilitating. Don’t trivialise or let anyone trivialise the first trimester symptoms. 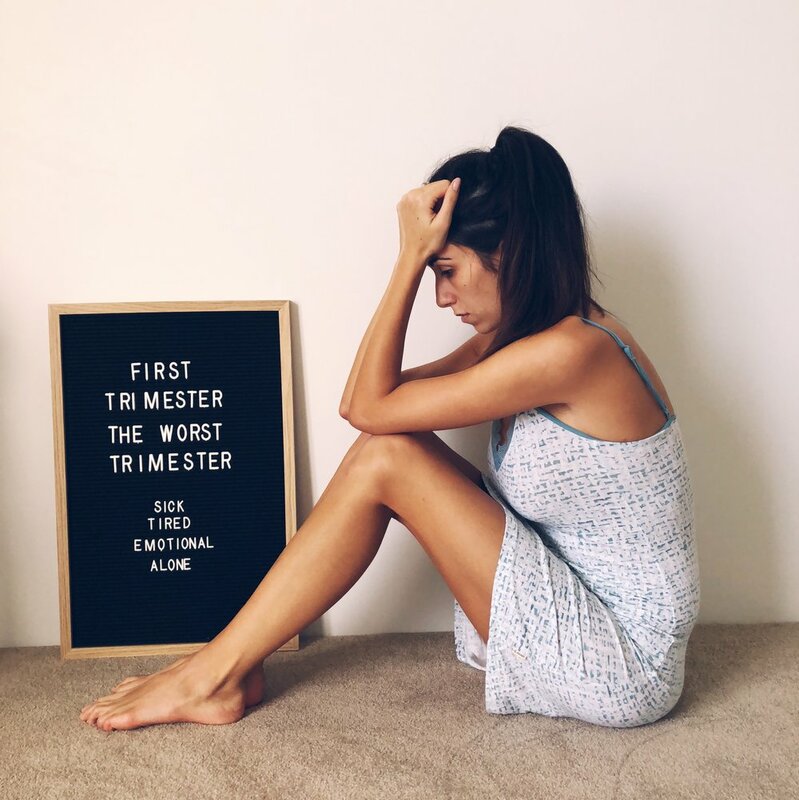 As I said at the start, it’s Ok to not be an ideal first Trimester mom! Dr Raina Ranney holds a Bachelors in Physiotherapy from the D.Y. Patil College in Mumbai and a Masters degree in Sports and Musculoskeletal Physiotherapy from the University of Melbourne. Upon her return to India in 2011 Raina decided to launch her own practice under the name of 'Genesis Physiotherapy'. Identifying a gap which existed in the Indian ecosystem, Raina treats athletes as well as recreational sports loving enthusiasts across a range of musculoskeletal and sporting injuries. Her methodologies are amongst the most advanced systems in the world as she uses a combination of myofascial trigger release techniques in combination with advanced taping, dry needling and strength building disciplines. Raina is also a Rehabilitation Consultant and works with patients before and after their surgical interventions, in addition to those suffering from chronic orthopedic and musckuloskeletal injuries, to speeden their process of recovery. Raina loves staying active, is an avid reader of just about everything, and has a doting little boy named Aeden whom she spends as much time as possible with.